The perfect cup of coffee starts with the best ingredients mixed the correct proportions. The best way to get the correct proportions is with a coffee scale. However, high-end manufacturers’ products can cost hundreds of dollars, which seems excessive given the relative simplicity of the product. On the other hand, low-cost products sometimes quickly break down, or never work correctly, to begin with. That can make shopping online a difficult prospect. There are a ton of coffee scales and no reliable way to figure out which is a good deal and which are rip-offs. We want you to be able to shop with confidence. Our reviews of the best coffee scales of 2019 are designed to show the good and the bad on each model so that you can make that perfect cup of coffee at a price which won’t leave you dumbstruck. If you’re looking for the best scale for pour over coffee, you can’t go wrong with the Hario V60 Drip Coffee Scale and Timer. This model measures to within one-tenth of a gram for weighs under 200 grams, making it one of the most accurate coffee scales you can find. It also has relatively fast measurements. No more adding water or coffee, only to discover that you’ve blown past your target when the scale updates. This model also comes with a timer, so you can keep track of how long your coffee has been brewing. This model also has a nice, clean look. While it’s small enough that you could put it in a pantry or under a counter when it’s not in use, you could easily leave it out on the counter all day without damaging your kitchen’s look. One potential problem which people may have with this model is that the automatic shut-off turns off rather quickly to preserve the batteries, but, know that this feature is disabled when the timer is activated. 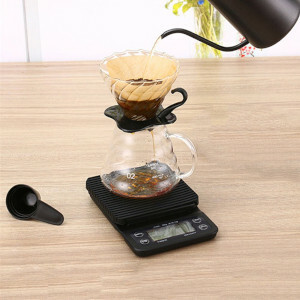 Overall, if you want to make sure that you’re making your coffee to exacting standards, you’ll love this coffee scale. The Brewista Smart Scale II has the potential to be a better coffee scale than the top model on our list. It comes with a waterproof silicone pad on its scale, which makes this model easier to clean and have better longevity than many scales on our list. It also comes with a rechargeable battery, so your cost of operation will be much lower compared to a model which uses disposable batteries. Plus, it measures in increments of .1 gram through all of its 2000g range, making it one of the most accurate scales you’ll find outside a laboratory. This model also comes with expresso modes, which allow you to automatically re-tare after adding each ingredient so that you don’t have to do any math on the fly. This makes it a great choice for commercial kitchens in addition to use at home. What keeps this model out of first place is its inconsistent quality control. Some units ship with peeling stickers, or functions which don’t work. You can always return the model for a working one, but that’s a big pain. Still, if you want the best experience possible, you may be able to get it with this model. The ERAVSOW Digital Hand Drip Coffee Scale is the model you’ll want to get if you want a great-looking scale at an affordable price. This model comes with a stainless-steel plate, making it one of the more attractive coffee scales that has ever been made. It also has the widest range of units out of any of the models on our list, as it can measure in grams, ounces, or in grams per milliliter, so you can use the system which best suits your needs. Also included is a timer, which makes it easy to keep track of your progress, even if you have to step away for a time. You can get this model for between half and a quarter of what you’d pay for the top two models on our list, so if you’re looking to save a lot of money on your next coffee scale purchase, look no further than this model. The downside to this model is that users report that it’s most accurate in .3- or .5-gram increments. If you need the best precision, you’ll need a different model. Still, for most people, this coffee scale is a great choice available at a great price. 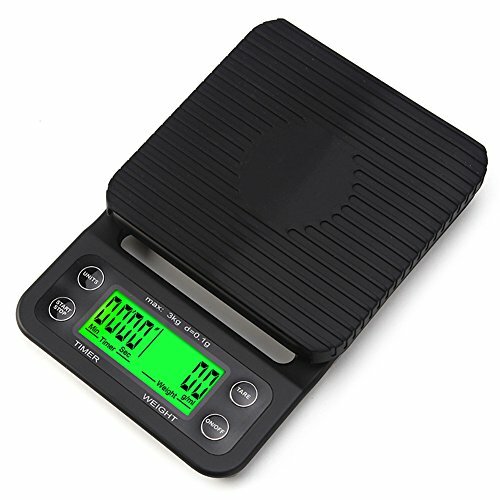 The OUTRY Coffee Scale with Timer is a coffee scale that has some potential. It comes with a timer, so you’ll always be able to keep track of how long your coffee has been brewing, even if you need to move on to other cooking tasks. It also comes with a high-quality silicone mat. While it doesn’t look as good as the stainless-steel plate found on other models, it works just as well when it comes to durability and keeping water out. Plus, this model comes with a hanging hook. You can still store it under a counter when not in use, but the hook gives you easy access to it and makes this a decent scale for commercial kitchens. However, this model is far from perfect. The biggest problem with it is that it burns through batteries very quickly. 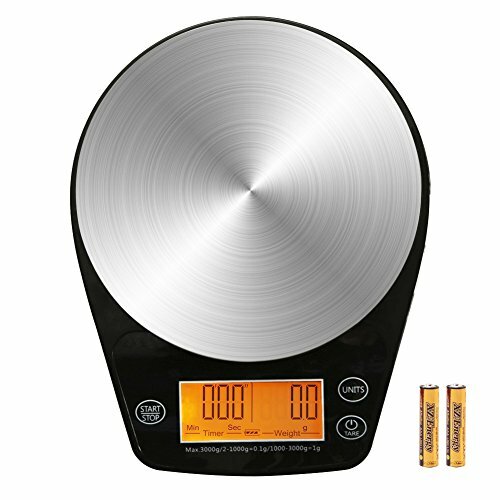 Even though it’s a cheap scale to buy, you’re going to end up spending a lot on batteries. It also doesn’t have great accuracy. Users have reported that taking something off and putting it back on without any changes will result in a different weight. While this is a cheap model, it won’t be the right one for most people. The HuiSmart Coffee Scale with Timer is another inexpensive model with a lot of problems. The best things about this model are its bright readout and its timer. If you’re working in a space which isn’t well-illuminated or just want to be able to easily read the scale from across the room. It also comes with a decent timer. However, one of this model’s big issues relates to that feature. This model comes with an automatic shut-off, which is good for saving battery life, but it shuts this scale off even if the timer is running, unlike a lot of models on this list. It also triggers too quickly, at about four minutes, which can be less than some coffee-related processes take to finish. This model is also tall from base to top, which means it can be too tall for use with commercial equipment, as standard cups may not fit. It does come with a detachable silicone mat, so you can clean it more easily, but it doesn’t do the greatest job of keeping water off the rest of the scale. Overall, there’s not a lot to like about this model, and it gives most people a frustrating time. You may already have figured out which model of coffee scale is right for you. If that’s the case, you may not need to read this buyer’s guide. However, if you’re undecided, and looking to learn more about what makes for a great coffee scale and get some more insight into why we reviewed these products in the way in which we did, then this guide is a must-read. We’ve packed it full of great information so that you can decide like an expert would, in just a short read. We’ve also included a section on value so that you can maximize the value you get when you’re ready to buy. When it comes to accuracy on coffee scales, scales that can make measurements in increments of one-tenth of a gram are the gold standard. While you could conceivably get a scale with a higher sensitivity, it would be hard to make changes in water or coffee as small as a few hundredths of a gram, so it makes sense that this is the smallest increment you commonly see on coffee scales. However, many models claim to be able to reach this excellent accuracy without actually being able to get there. There’s no certifying body, so there’s no hard and fast way to know that you’re getting a properly-calibrated scale. However, if you’re strongly considering a cheaper model, you’ll want to read a lot of online reviews. If there’s any hint of inaccuracy, it’s best to steer clear of the model. It’s also a good idea to get a model which can tare. That means you can add weight to the scale and then re-zero it. That greatly reduces the amount of math you’ll need to do while making your coffee. Coffee scales are generally powered in one of two ways. The first is with disposable batteries. While these models are usually cheaper upfront, they have a higher cost in the long run, as disposable batteries aren’t the cheapest implements out there. However, that means you generally don’t have to worry about recharging your coffee scale, and if it’s a model which can hang from the wall, you won’t have to worry about trying to get a power cord to it. A few models are starting to come with a rechargeable battery. These models are cheaper to operate, and better for the environment in the long run. However, if they go dead, you’ll have to wait for them to recharge before you start using them, and you have to be judicious about putting them back on their charger to avoid that situation. The best way to keep your coffee scale clean is to never spill anything on it, but if you’re anything like us, accidents happen. Certain scales make cleaning easier than others. The most cleanable models come with detachable silicone pads. Just take these off and run them under water, and you’ll be good to go. Most models, however, come with fixed surfaces. The most cleanable of these are those made from either stainless steel or from silicone, since neither surface stains easily, and both allow for cleaning with a washcloth. Some models make it tricky by adding ridges to their silicone surfaces. These help give a little extra grip and do a superior job of keeping excess heat away from the scale, but they can sometimes be hard to clean. Which coffee scale is right for you? There are a lot of coffee scales on the market, so it can get overwhelming at times when trying to choose one. The important thing to remember is that ultimately, the coffee scale is going to have to work for you. Many people start shopping by looking at the most or least expensive models, but it’s a better idea to start with your own needs. Consider the value you place on different features such as accuracy or ease of cleaning, and then make a short list of coffee scales that excel in those areas. Eliminate any that won’t live up to your expectations, then rank the remaining models by price. The secret to getting great value is to select the model from that list which costs the least. It has all the features you need to have a great experience, without any of the bells and whistles that would drive up the price, even if you don’t use them. Plus, it has the lowest available price, making it the best overall value for the money. The Hario V60 Drip Coffee Scale and Timer is our favorite model due to its great accuracy and timer, as well as its fast measurements that let you spend less time prepping and more enjoying your brew. 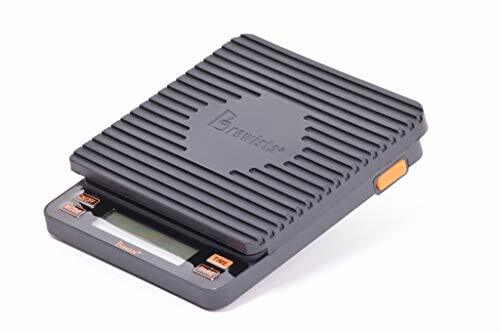 The Brewista Smart Scale II offers a waterproof silicone pad, great accuracy, and a rechargeable battery, though its inconsistent quality control drops it out of first place. 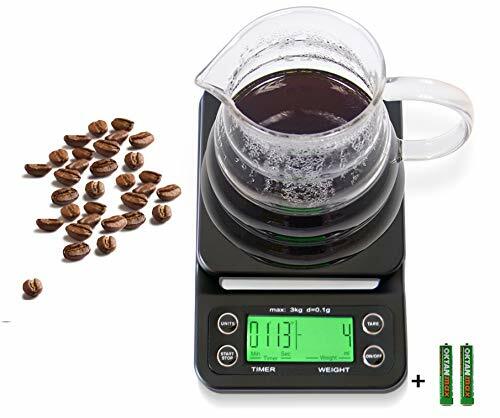 The ERAVSOW Digital Hand Drip Coffee Scale comes with a stainless-steel plate and can measure in ounces and grams. You can get it for less than half of what you’d pay for the top two models on our list, earning it the title of “best value for the money.” The OUTRY Coffee Scale with Timer includes a silicone mat and a hanging hook that make it good for commercial kitchens, but its low efficiency and iffy accuracy drop it to fourth place. 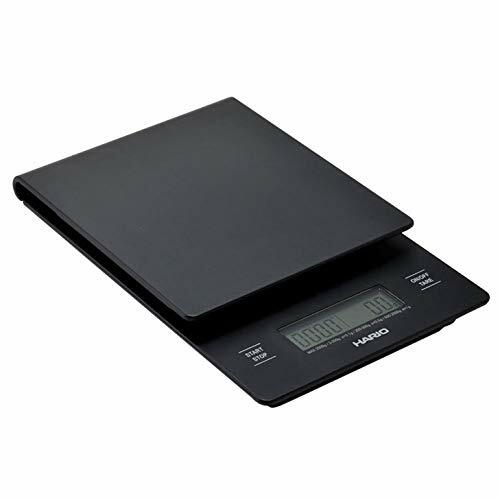 In last is the HuiSmart Coffee Scale with Timer, which has the brightest readout, but its height and short auto-off function greatly hurt its value. We hope that our reviews and buyer’s guide have helped you come to better understand coffee scales and have helped you find a model you’ll love. Which espresso maker is best-suited for office-use?